The first bed I created, almost 30 years ago, was on the lower boundary of our back garden, but our garden has grown so now it is half way down the garden. I made a planting plan but inevitably this has evolved. Plants die, they get too big, they look 'wrong' or I just stop liking them. 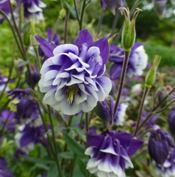 A healthy garden goes on changing as does a maturing gardener. At one stage I had a hedge of the Hybrid Musk rose 'Penelope' at the back of the bed, but it was just too fussy, so I removed most of them. Now the bed has a backdrop of shrubs including Cotoneaster franchetii (the elegant arching branches are laden with red berries in the autumn), Cotoneaster 'Rothschildianus' (yellow berries) and Cotinus coggygria (autumn leaves of this Smoke tree have tints of red, yellow and orange). I added a Parrotia persica (Persian ironwood tree) to provide a blaze of yellow and orange in autumn. It should reach 10 feet after 7-8 years..and something else will have to come out. 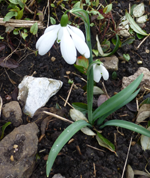 I have a number of snowdrops in this bed including "freaky" 'Mrs Thompson'- the flowers have anything from 4 to 6 outer petals. The narcissi 'Jack Snipe' and 'Jenny' (lovely- flowers get paler as they age) indicate the arrival of spring. Tulips are less reliable and even though I plant deeply, I lose many after a few years. 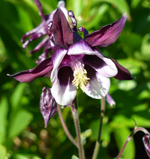 Herbaceous plants, mostly old favourites that are good doers, include aquilegias and geraniums such as G. pratense 'Plenum Violaceum' (definitely my favourite with exquisite small double violet flowers), G. 'Rozanne' (a long season with large blue flowers) and G. psilostemon (shocking pink). Clumps of peonies, 'Early Scout' (dark red), 'Bowl of Beauty' (deep pink), 'Sarah Bernhardt' (pink) and 'Duchess de Nemours' (white) are slowly enlarging, and I also have that indestructible cottage plant, Paeonia officinalis 'Rubra Plena'. The white daisies of the Shasta daisy, Leucanthemum x superbum, a stalwart of any cottage garden, appear later in the year. Michaelmas daisies in pinks, purples and blues are the star turn in autumn. Butterflies and bees love them and so do I.